An election campaign in Israel but little mention of the peace process. Our correspondent says voters there just want to live normal lives. 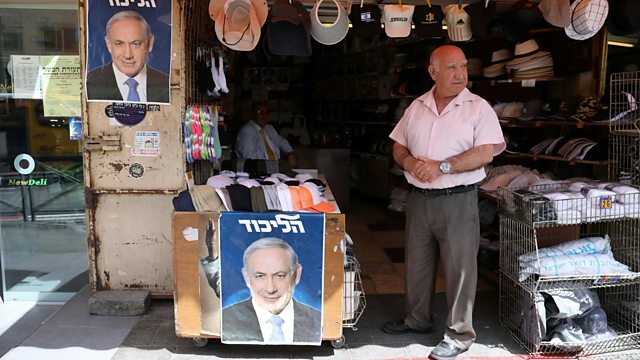 An election campaign in Israel but little mention of the peace process. Yolande Knell says voters there just want to live normal lives. They're picking up the pieces in Rio de Janeiro after the fire which destroyed the 200-year-old National Museum. Tim Whewell says they've lost artefacts that simply cannot be replaced. The Romanian government is not happy that the former head of its anti-corruption directorate is now in the running for the new post of Chief Prosecutor for the European Union. Tessa Dunlop says it's worried the former basketball player knows all their dirty secrets. Sarah Sands takes a trip up the Suez Canal, scene of Britain's humiliation in 1956, in a British destroyer. She ponders the importance of trade then and now. And in India law students are being taught Harry Potter. Rahul Tandon has taken a class.